The Year of the Monkey blockbuster THE MONKEY KING 2 (SAI YAU GEI ji SUEN NG HUNG SAM DA BAK GWUT JING) yesterday held a HK$ 5 million press conference in Beijing. Film stars Aaron Kwok Fu Sing, Gong Li, Feng Shaofeng, Xiao Shenyang, Law Chung Him and Kris Philips (Fei Xiang) ran into each other again after the wrap and set off spark. Over 400 Chinese and foreign reporters witnessed the event. As the "Pretty Monkey King" Sun Wukong, Sing Sing praised his on screen rival Gong Li as the most excellent actress. Later he even gave the guests a surprise as he debuted the music video for the film theme song that he performed, film music master Peter Kam Pui Tat scored and Siu Mei wrote the lyrics for, tailored for MONKEY and the Year of the Monkey, IT IS SUN WUKONG. With his 20 years of dance experience Sing Sing sang, danced and fought, even displaying his unique "Golden Monkey Golden Hoop dance". Already trained like the "72 transformations of Sun Wukong", Kwok Fu Sing for the character even began training three months before the shoot. He personally performed the stunts. Speaking of the film theme song, Sing Sing said that he and Sun Wukong shared the same breath and fate. "The similarity may be because he and I both have that stubbornness to be completely focused on completely a task." He also lived up to his "Year of the Monkey spokesman" title as he promoted hard. "Everyone please bring your own Year of the Monkey family and friends to the movies to see THE MONKEY KING 2. I will give away 1,000 Sun Wukong paraphernalia as gifts." The "White Bone Spirit" Gong Li "faced off" with the Venerable Tang Monk and his disciples. She even displayed her "demon queen" nature and joked with them. "Just eating the Tang Monk isn't enough, he's too thin!" Although in the film she and Sing Sing were enemies, at the press conference she let go of her "grudge" and kissed up to him. She stated that when Sing Sing played Sun Wukong she felt that the real "Pretty Monkey King" was born. "His acting is great, as the Sun Wukong he is quite dominating and mighty! However I also feel a little scared, luckily I have the Tang Monk to protect me." She also said that the character was the biggest challenge of her film career. She not only challenged the wires for the first time but also had to expend a lot of energy on the martial art action. At the same time she also had to play the character from age 18 to 81, which was extremely difficult. She still felt it was well worth the effort though as she fulfilled a childhood dream. She said, "When I was asked to play the White Bone Spirit, I knew the time has arrived for me to accept the challenge and fulfill my Journey to the West dream." In addition, Filmko chief Alex Wong Hoi Fung hoped that MONKEY's classic Chinese story will move the audience again and not disappoint the expectation the world has for Chinese film. 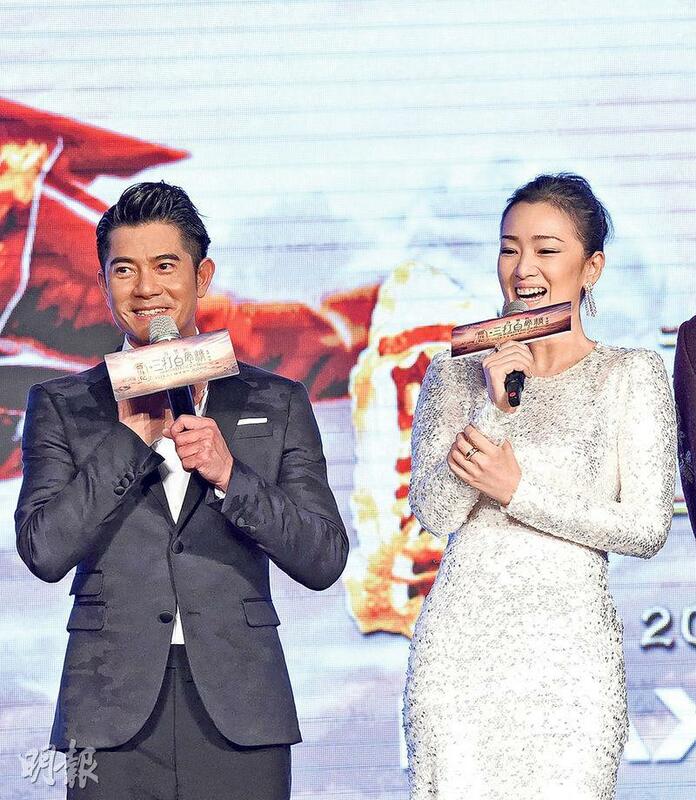 Feng Shaofeng, Xiao Shenyang and Law Chung HIm yesterday kissed up to Gong Li as well. When Gong Li called Xiao Shenyang "Mr. Xiao Shenyang" he was so happy that he dropped to the floor and pretended fainting from the excitement. Later he also said that on the set he constantly stopped goddess Gong Li from speaking with other men. "Other than my Ma, my wife, daughter, the woman in my heart is my sister (Gong Li). I want to love my sister for life, I love you." The extremely gross words cracked up the audience. Law Chung Him and Feng Shaofeng were much more reserved than Xiao Shenyang. Law Chung Him praised Gong Li as kind while Feng Shaofeng said that Gong Li constantly treated everyone to snacks.